Citation: C N Trueman "Charles de Gaulle"
Charles de Gaulle was the man seen by many French people to have been their true leader in World War Two. 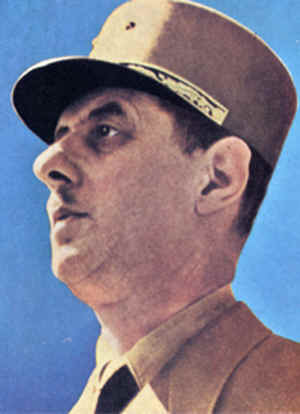 Charles de Gaulle had a military background, but he quickly became the political figurehead of the Free French Movement that was based in Great Britain during World War Two. Charles de Gaulle was born in 1890 at Lille. His family had a tradition of being teachers and administrators. However, de Gaulle decided on a career in the army and he joined the 33rd Infantry Regiment led by the then Colonel Pétain – later Marshall Pétain, who found fame in World War One and infamy in World War Two. Charles de Gaulle fought in World War One and was wounded and taken prisoner at Verdun in 1916. Between 1919 and 1920, he was with a French military mission based in Poland. Always regarded as a thinker, de Gaulle became a lecturer at the French Staff College in 1923 and it was here that he developed his ideas of a mobile war using tanks and planes. He had experienced the horrors of static war in World War One but also the success of a mobile campaign, as he witnessed in Poland, and his ideas in the 1920’s were obviously formulated around these experiences. Ironically, Heinz Guderian is usually credited with creating what was to be known as Blitzkrieg in World War Two. However, the ideas of men such as Charles de Gaulle and Britain’s Captain Liddell-Hart tend to be overlooked when looking at the background to Blitzkrieg. Whereas Guderian was given Hitler’s full support once he got to power in 1933, de Gaulle found that his ideas were not seized on by the French High Command – a similar experience to Liddell-Hart. In World War Two, Charles de Gaulle commanded an armoured division. The French Army and the British Expeditionary Force wilted under the onslaught of the German’s Blitzkrieg which pushed both back to the beaches around Dunkirk. Whereas the Germans had put a great deal of development into their tanks and planes, the same could not be said of the French and British. After the surrender of the French, de Gaulle escaped to Britain. He now developed what can only be described as a political role as he could do little at a military level. De Gaulle called on all French people to resist the Nazi occupiers. His pride at being French, his aloof manner, his patriotism and his obvious sense of mission impressed many and he became the head of the Free French movement. Despite his status and the fact that he had actually fought in World War Two, de Gaulle was a difficult ally for Winston Churchill and F D Roosevelt. His personality did not help make friends and de Gaulle did not go out of his way to be popular. He was highly offended by what happened at the Allied meeting at Casablanca. At this meeting, held in French Morocco, de Gaulle was invited to attend a meeting being held in what he considered to be France. This invite greatly upset him as he felt that as a Frenchman and the accepted leader of the Free French, he should have been an automatic choice for the conference – not an invited guest. He was not even given prior knowledge of the meeting, which seemed to emphasise what de Gaulle considered to be his second class status amongst the Allies. In June 1943, de Gaulle was appointed head of the French Committee of National Liberation based in freedAlgiers. Just about one year later, the start of the liberation of France took place with D-Day on June 6th. Now a national hero, de Gaulle returned to Paris on August 25th, 1944. His return was greeted by tens of thousands of Parisians – even though Paris was still not safe as German snipers were still operating in the city. On October 23rd,1944, de Gaulle was officially recognised by the Allies as the head of the French government and his administration received a similar endorsement. However, de Gaulle’s difficult relationship with Winston Churchill and Roosevelt continued when he was not invited to attend with the ‘Big Three’ (Stalin, Churchill and Roosevelt/Truman) meetings at Yalta and Potsdam.